For many years, Freighter has been a popular choice for transport operators running road trains in Northern Australia. The trailer manufacturer is renowned for its reliability, durability and national service and support network, meaning Rogers Transport didn’t have to think twice about which trailers to buy after they won a large contract for the Gladstone Coal Seam Gas project. Gary Rogers runs a lucrative operation out of Brisbane’s transport hub of Rocklea. Never short on business, his company Rogers Transport doesn’t even have a need to advertise, with the receptionist constantly kept busy by a ringing phone. Spending just ten minutes with Gary saw his own phone ring four or five times from customers looking to move their latest load. “We operate a premium service,” says Gary. “When we deliver, we deliver freight with care and timeliness. I think word gets around about that on its own without our help.” He’s right – with a fleet consisting of 150 pieces of individual equipment, which includes 50 prime movers, Gary’s business is continually growing. Part of the growth recently came when Rogers Transport won a contract to deliver large steel pipes from Gladstone to Injune as part of the Gladstone Coal Seam Gas (GLNG) project. As soon as he won the contract, Gary made the decision to buy a new set of flat top semi-trailers. He knew exactly who to turn to. “Our salesman Mick Wooller is also a great bloke, which helps,” he laughs, after a nudge from Mick. The GLNG contract required two road trains to do the run, delivering a total of up to 16 pipes per day. Gary already had one Freighter flat top semi-trailer road train set in his possession, so placed the order with Mick for another. And that’s the exact response you want from a set of durable, sturdy and reliable semi- trailers. 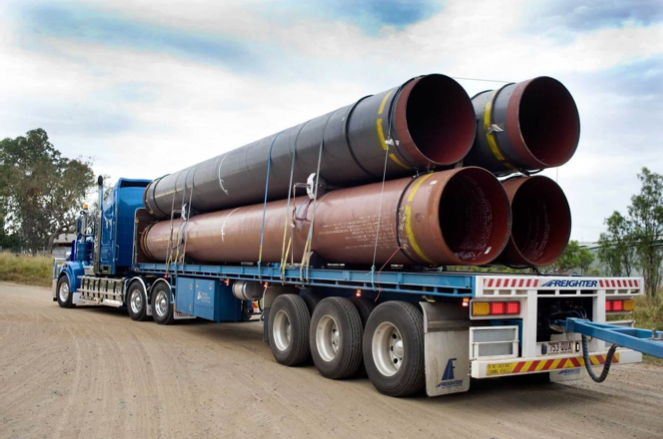 Rogers Transport is delivering steel pipes to a large coal seam gas project in Queensland using Freighter semi-trailers.